The question paper of Preliminary (Screening Test) and the question paper of Main examination will be supplied in English version only. The Preliminary (Screening Test) is of Objective type and is likely to be held on Dt.16/07/2017 and the Main Examination (Objective Type) is likely to be held on 12 OR 13/08/2017. The Commission reserves the right to conduct the Examination either COMPUTER BASED RECRUITMENT TEST (CBRT) or OFFLINE OMR based Examination of objective type. 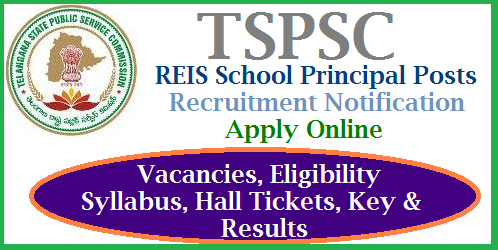 Principal (School) in Telangana Residential Educational Institutions Society. Principal (School) in Telangana Social Welfare Residential Educational Institutions Society. Principal (School) in Mahatama Jothiba Phule Telangana Backward Classes Welfare Residential Educational Institutions Society. Principal (School) in Telangana Minorities Welfare Residential Educational Institutions Society. Principal (School) in Telangana Tribal Welfare Residential Educational Institutions Society. Regulations indented by the Residential Educational Institutions Societies as on the Date of Notification. iv) A total teaching experience of not less than (8) years including not less than (5) years as PGT/J.L. in any Government / Aided/Government recognized High School/ Junior College and (3) years of administrative experience as Head Master/ Principal of Government / Aided / Government recognized High School/ Junior College.